This chapter discusses terminal I/O in InterSystems IRIS Data Platform™. The terminal or console on which you log in to InterSystems IRIS is your principal device. You need not open your principal device. If you have not issued an OPEN and a USE, the first time a process issues a READ or WRITE, the system opens your principal device automatically, and establishes it as the current device, as if you had issued OPEN 0 USE 0 explicitly. See the chapter “I/O Devices and Commands” for more information on the device-independent $IO special variable. The next sections describe terminal-specific information about the remaining special variables. $X contains the horizontal position and $Y the vertical position of the cursor or print head. $X=0,$Y=0 denotes the upper left corner of the CRT screen or the printed page. InterSystems IRIS calculates both $X and $Y modulo 256; that is, they range from 0 to 255 and then begin again at 0. By default on UNIX® and Windows, when writing or echoing any string that includes the ASCII Escape character (decimal value 27), InterSystems IRIS updates $X and $Y just as it does for any other character sequence. Thus, ANSI standard control sequences, which the terminal acts on, but does not display, can upset the relationship of $X and $Y to the cursor's position. 256 $ZA\256#2 InterSystems IRIS detected an invalid escape sequence. While many of the conditions that $ZA shows are errors, they do not interrupt the program's flow by trapping to the $ZTRAP special variable. Programs that are concerned with these errors must examine $ZA after every READ. Of course, a Ctrl-C with breaks enabled will trap to $ZTRAP. For more on error trapping and $ZTRAP, see the Error Processing chapter of Using ObjectScript and $ZTRAP in the ObjectScript Language Reference. $ZB shows what character sequence or event ended the last READ operation on the current device. You cannot set $ZB; InterSystems IRIS sets the value of $ZB each time you perform a READ. You can use this value to act on non-printable characters such as the up arrow key or function keys. Establishes ownership of the terminal. An optional parameter list can set the right margin, specify device protocols, and specify one or more termination characters. Following the parameter list, you can optionally specify a timeout argument, and/or a mnespace argument. The mnespace argument specifies the InterSystems IRIS routine where control mnemonics for use with WRITE /mnemonic are defined. OPEN retains control until the opening of the device is complete, unless you specify a timeout. With a timeout, if InterSystems IRIS cannot open the device in the number of seconds you specify, it sets $TEST to 0 and returns control to the process. Even if a device is unavailable at the operating-system level, OPEN keeps trying to obtain the device until it succeeds or the timeout expires. You can specify these optional parameters as either positional parameters (in the order shown), or as keyword parameters with the syntax /KEYWORD=value. Keyword parameters may be specified in any order; because InterSystems IRIS executes parameters in left-to-right order, interactions between parameters may dictate a preferred order in some cases. You can mix positional parameters and keyword parameters in the same parameter list. The enclosing parentheses are required if you specify more than one parameter. The optional parameter list is enclosed in parentheses and can contain the margin, protocols, and terminator parameters. You can specify the optional margin, protocols, and terminator parameters as either positional parameters (in the order shown), or as keyword parameters with the syntax /KEYWORD=value. Keyword parameters may be specified in any order; because InterSystems IRIS executes parameters in left-to-right order, interactions between parameters may dictate a preferred order in some cases. You can mix positional parameters and keyword parameters in the same parameter list. The enclosing parentheses are required if you specify more than one parameter. The 1st positional parameter: An integer value specifying the right margin (and thus the number of characters per line). Values from 1 to 255 set the right margin for output; any other value disables the right margin. An empty string leaves the margin setting unchanged. On Windows platforms, you cannot use “:n” to control the print margin used. Such notation is ignored by InterSystems IRIS. Code such as “|PRN| :121” is ignored. To control the printer width, send the appropriate control characters for that printer. The notation does work on other platforms. The default margins for various terminal types are defined in the Management Portal. Select System Administration, Configuration, Device Settings, Device Subtypes. When you click on “Edit” for each listed device subtype, it displays a Right Margin: default option. The 2nd positional parameter: A string of letter code characters enclosed in quotation marks (for example, "BNFU), where each letter enables one of the terminal's rules for communicating. Letter codes are not case-sensitive. Letter codes may be specified in any order; because InterSystems IRIS executes them in left-to-right order, interactions between letter codes may dictate a preferred order in some cases. For a table of letter codes, see Letter Code Protocols. The Modem Control parameter determines how InterSystems IRIS responds to the state of the RLSD (Received Line Signal Detector) pin, also known as the DCD (Data Carrier Detect). If the line is modem controlled (modem control=1), InterSystems IRIS monitors the state of the RLSD, and generates an <ENDOFFILE> error if a READ command is issued when carrier is not present. InterSystems IRIS does not generate an error when a WRITE command is issued when carrier is not present. This is because it must be possible to send the dial command to the modem prior to a connection being established. InterSystems IRIS modem control can be enabled (1) or disabled (0) at any time. It is suggested that you disable modem control while sending commands to the modem, then enable modem control once carrier is detected and connection has been established. The $ZA Error Reporting parameter enables reporting of the status of modem control pins to the $ZA special variable. This checking can be done regardless of the Modem Control byte setting for the COM port. If $ZA error reporting is enabled, COM port errors are cleared with a call to the Windows ClearCommError() function. The port error state is reported in the $ZA bits 16 through 22. For a table of $ZA bit values, refer to $ZA in the ObjectScript Reference. /COMPRESS=str "" Specifies the stream data compression type. You can enable a compression type of ZLIB or ZSTD. You can specify /COMPRESS="" to disable compression. /COMPRESS="zlib" is equivalent to /GZIP=1. To compress a string, use %SYSTEM.Util.Compress(). Special situations or terminals can require different protocols. With the protocols letter code parameter (or the corresponding keyword parameters) you can change the rules by which InterSystems IRIS communicates with the terminal. Protocols affect normal and single-character reads alike. Normal mode, with all special protocols disabled, suffices for most terminal I/O. In normal mode InterSystems IRIS echoes each incoming ASCII character, sending it back to appear on the terminal. 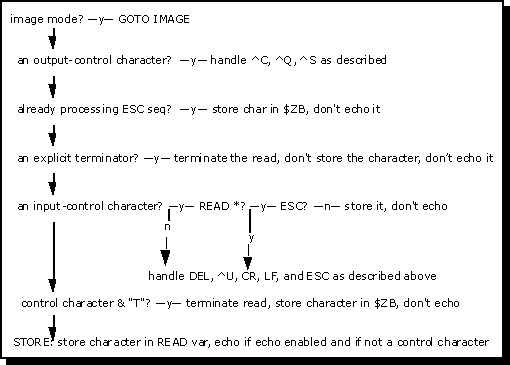 A Return, or a valid escape sequence, ends a READ command. F Flush Flush (empty) the input buffer before each READ. You can flush the input buffer to prohibit the user from typing ahead of READ operations on the terminal, because InterSystems IRIS discards anything typed between READ operations. Note that the command WRITE *1 flushes the input buffer at any time, regardless of the F protocol. Image mode (I) protocol can be combined with other protocol characters. In image mode, InterSystems IRIS ignores the protocol characters P, C and B. In image mode, the protocol characters F, N, R, S, and T remain in effect. When not in image mode, the device is in N (normal) mode. P Print device The ASCII Delete character echoes as a backslash (\), and Ctrl-U echoes as “^U” followed by a carriage return and line feed. When you issue an OPEN command for a terminal, InterSystems IRIS invokes the protocol C or P automatically, depending on the operating system terminal setting. These protocols remain in effect until you change the protocols for the device explicitly. A protocol string containing neither C nor P does not cancel this protocol. The letter codes BP turn on the B and P protocols. This example enables breaks (B) and tells InterSystems IRIS to treat the terminal as a printing device (P). InterSystems IRIS supports read line recall for both variable-length terminal reads (READ variable) and fixed-length terminal reads (READ variable#length). InterSystems IRIS does not support read line recall for single-character terminal reads (READ *varaiable). Read line recall supports the optional timeout argument. Each operating system intercepts certain protocol characters (UNIX®) or key combinations (such as CTR-ALT-DEL on Windows platforms), preventing these characters from affecting InterSystems IRIS. The console for Windows makes no attempt to override these operating system characteristics. Other special characters can alter the way your routines execute, but do not appear in the READ command variable. Operating your terminal in image mode cancels these effects and causes InterSystems IRIS to treat these characters like any others. Ctrl-C 3 If breaks are enabled, Ctrl-C interrupts a routine's execution. The routine behaves as though an <INTERRUPT> error has occurred. If breaks are disabled, Ctrl-C causes InterSystems IRIS to discard anything entered thus far in the current READ. You can use Ctrl-C to interrupt global module requests that require network operations. To trap Ctrl-C, set the special variable $ZTRAP. For additional information, see the section on enabling breaks. Ctrl-S 19 Ctrl-S suspends output to the terminal. Output to the terminal resumes when InterSystems IRIS encounters a Ctrl-Q. Escape 27 Begins an escape sequence. The sequence itself ends the READ, and $ZB contains the full sequence, including the leading Escape. InterSystems IRIS does not echo the characters of the sequence, but it does change $X and $Y unless you include the escape sequence in a WRITE * command. See $X and $Y and Cursor Position earlier in this chapter. An invalid escape sequence sets bit 8 of $ZA. Consider the example, READ X. After you enter the characters “AB”, Escape, and “E”, X will contain the two characters “AB”, while $ZB contains the two characters Escape E. $X increases by two for the AB, but does not increase for the E.
LineFeed 10 InterSystems IRIS interprets LineFeed as a terminator for all terminal I/O. Using the UNIX® job control character, Ctrl-Z, within InterSystems IRIS can cause serious problems. For this reason, InterSystems IRIS disables Ctrl-Z automatically when you enter InterSystems IRIS on platforms whose UNIX® shell supports job control. InterSystems IRIS reenables Ctrl-Z when you exit InterSystems, and when you issue a $ZF(-1) call to execute a UNIX® shell command. *variable WRITE *variable writes one character, whose decimal value equals x. The value of variable should be an integer in the range 0 to 255 for ASCII characters, and >255 for Unicode characters. By convention, values from 0 to 127 signify 7 bit ASCII characters, while 128 to 255, which represent the extended ASCII character set, relate to the application itself. If the hardware and software are properly set, InterSystems IRIS can handle 8 bit data. Example : You can use the eighth bit to represent international character sets. InterSystems IRIS routines often use WRITE * to send control characters for device dependent functions. Example : WRITE *27,*91,*50,*74 clears the terminal screen. WRITE * does not change $X or $Y; the assumption is that WRITE * output is highly specific to the output device. An input buffer holds characters as they arrive from the keyboard, even those you type before the routine executes a READ command. Thus you can answer questions even before they appear on the screen. When the READ command takes characters from the buffer, InterSystems IRIS echoes them back to the terminal so that questions and answers appear together. When a routine detects errors, it may issue WRITE *-1 to cancel these answers. /mnemonic Issuing WRITE /mnemonic causes InterSystems IRIS to interpret mnemonic as defined in the active mnemonic space. If there is no active mnemonic space, an error results. You can specify the active mnemonic space in two ways: By naming a default mnemonic space for each device type using the Namespace and Network Configuration editor by specifying a mnemonic space in the OPEN or USE command for the device. For more information, see Controlling Devices with Mnemonic Spaces. In the above example, InterSystems IRIS clears the input buffer when the second READ is issued. Thus any text typed during either HANG is cleared from the buffer. In the above example, InterSystems IRIS immediately clears the input buffer when WRITE *-10 is issued. Thus any text typed during the first HANG is cleared, but any text typed during the second HANG is supplied to the second READ command. Have your InterSystems IRIS system manager enter %X364 as the default mnemonic space in the IO Settings configuration setting. From the Management Portal, select System Administration, Configuration, Device Settings, IO Settings. Then InterSystems IRIS can correctly interpret the DTM control mnemonics in WRITE /mnemonic commands, shown in the following table. Writes one or more lines of the currently loaded InterSystems IRIS routine to the current device. Optionally the character “O” (the letter), decimal value 79. Zero or more characters with decimal values 3247. One character with decimal value 48126. The “[” character, decimal value 91. Zero or more characters with decimal values 4863. One character with decimal value 64126. In the following figure, the user is asked to enter an ID. If the user presses Esc-?, a Help screen appears. The subroutine ESCSEQ assumes that nonstandard escape sequences end with an asterisk “*”. InterSystems IRIS prefers that you use full duplex terminals; in other words, your keyboard should operate independently from your printer or screen. Full duplex means simultaneous and independent transmission in both directions. Half duplex means transmission in only one direction at a time. Duplex has nothing to do with echo, although you may see a terminal marked full duplex for remote echo and half duplex for local echo. This designation means that the terminal displays the characters you type and does not expect InterSystems IRIS to echo them. Set your terminal to local echo off or full duplex, letting InterSystems IRIS provide the echo. The echo comes not when the computer receives the character, but when the READ command takes it from the input buffer; therefore, the prompts and answers of a dialog keep their intended positions on the screen regardless of whether the user types ahead. InterSystems IRIS provides flexible protocols and large independent buffers enable routines to deal with unusual devices and their protocols. For example, InterSystems IRIS easily supports full duplex communication between two computers on a terminal-to-terminal link. Two InterSystems IRIS systems require only a physical connection, the right protocols, and identical settings of speed, parity, and character length. With the aid of external converters, InterSystems IRIS communicates with IBM ports as a synchronous EBCDIC terminal. In image mode, InterSystems IRIS does not support XON/XOFF. In nonimage (normal) mode, the operating system's terminal parameters determine whether the computer issues an XOFF if the operating system's input buffer is almost full. If XOFF and XON are not supported, make the buffer large enough that you do not need them.